Family members of patients in hospice can use this complaint letter to address care problems in a facility. 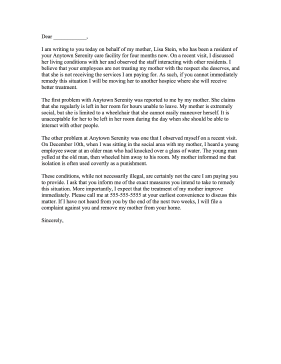 I am writing to you today on behalf of my mother, Lisa Stein, who has been a resident of your Anytown Serenity care facility for four months now. On a recent visit, I discussed her living conditions with her and observed the staff interacting with other residents. I believe that your employees are not treating my mother with the respect she deserves, and that she is not receiving the services I am paying for. As such, if you cannot immediately remedy this situation I will be moving her to another hospice where she will receive better treatment. The first problem with Anytown Serenity was reported to me by my mother. She claims that she regularly is left in her room for hours unable to leave. My mother is extremely social, but she is limited to a wheelchair that she cannot easily maneuver herself. It is unacceptable for her to be left in her room during the day when she should be able to interact with other people. The other problem at Anytown Serenity was one that I observed myself on a recent visit. On December 10th, when I was sitting in the social area with my mother, I heard a young employee swear at an older man who had knocked over a glass of water. The young man yelled at the old man, then wheeled him away to his room. My mother informed me that isolation is often used covertly as a punishment. These conditions, while not necessarily illegal, are certainly not the care I am paying you to provide. I ask that you inform me of the exact measures you intend to take to remedy this situation. More importantly, I expect that the treatment of my mother improve immediately. Please call me at 555-555-5555 at your earliest convenience to discuss this matter. If I have not heard from you by the end of the next two weeks, I will file a complaint against you and remove my mother from your home.